Creamy, smooth, and decadent this Chai Crème Brulée has the perfect flavor profile and insanely pleasing texture. Dairy-free option included. This recipe was sponsored in partnership with Rodelle. Opinions are my own. 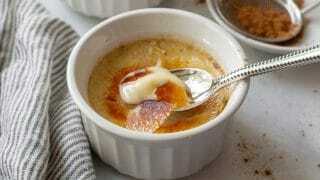 Creme brulee is a custard like dessert topped with a crunchy coating of melted sugar. It’s often seen as a complicated dessert but it’s actually very simple to make and only requires a few ingredients. No wonder so many restaurants offer it as an option on the menu. 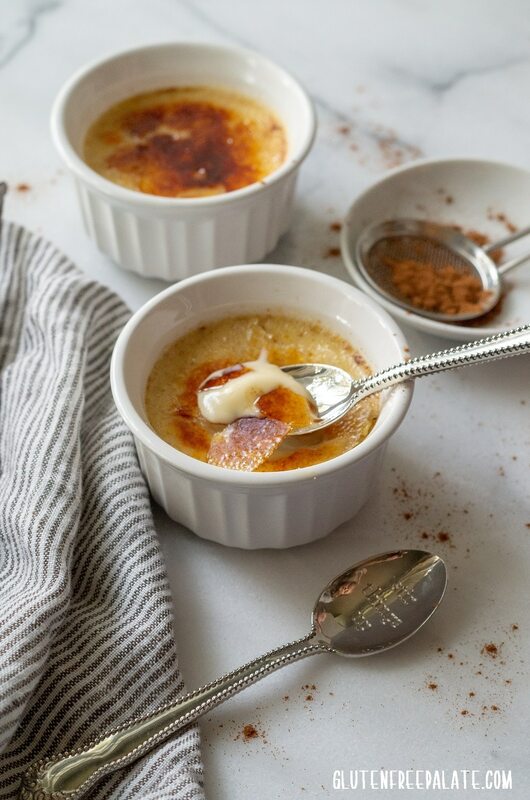 Chai Creme Brulee is naturally gluten-free and it can be made dairy-free. When I first made creme brulee I made the mistake of thinking that I messed up the recipe because it wasn’t firm out of the oven. I later learned after several attempts that it finishes setting up as it chills. The chilling process helps preserve the creamy texture while transforming it into a custard. 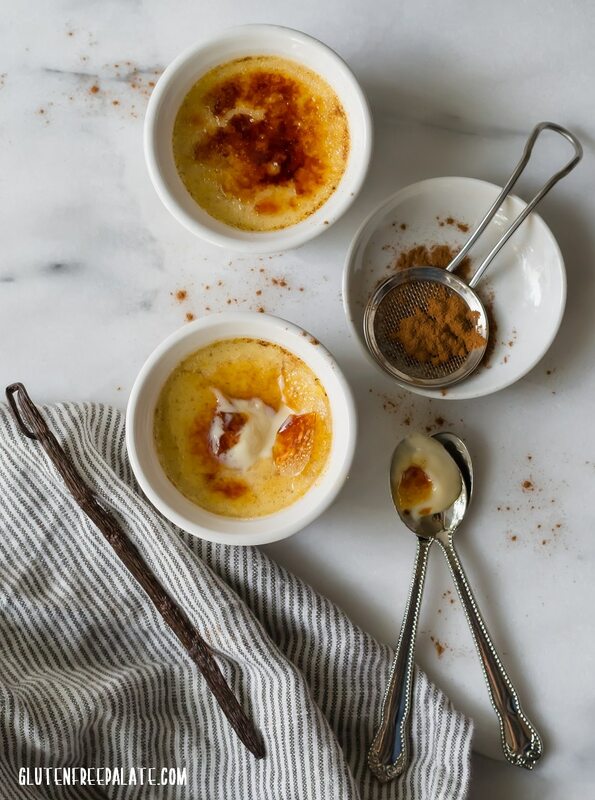 Most creme brulee, like this chai creme brulee, are finished off using a kitchen torch or a culinary torch. The high heat melts the sugar on top creating a hard, crunchy layer of sugary sweetness. You can achieve similar results by placing your sugar topped creme brulees under a broiler. Make sure to let the sugar on top cool before you dip your spoon into it. I am a HUGE fan of anything chai and I just had to make a chai creme brulee for you. I used a combination of spices that you can find in most kitchens. 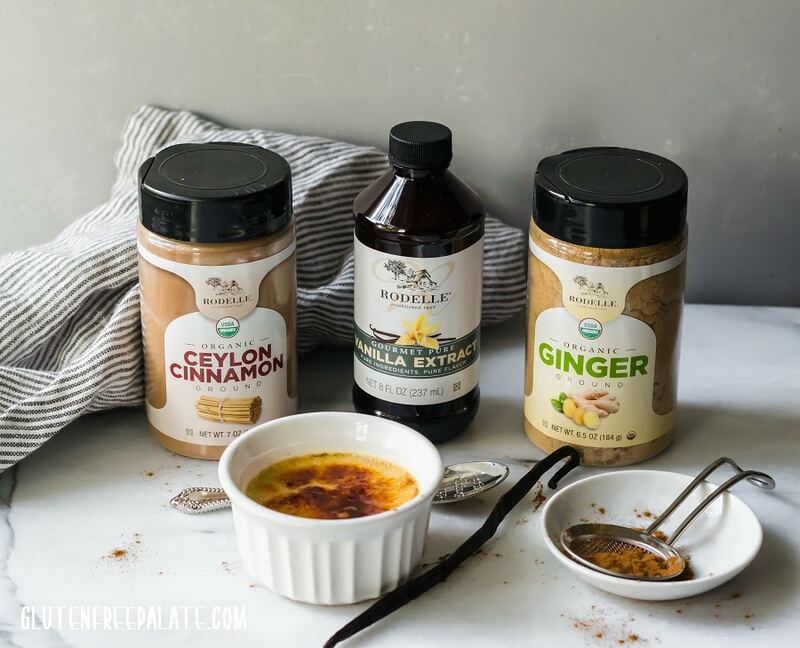 You don’t need to seep chai tea bags to make this chai creme brulee, the spices will add the flavor profile for you. 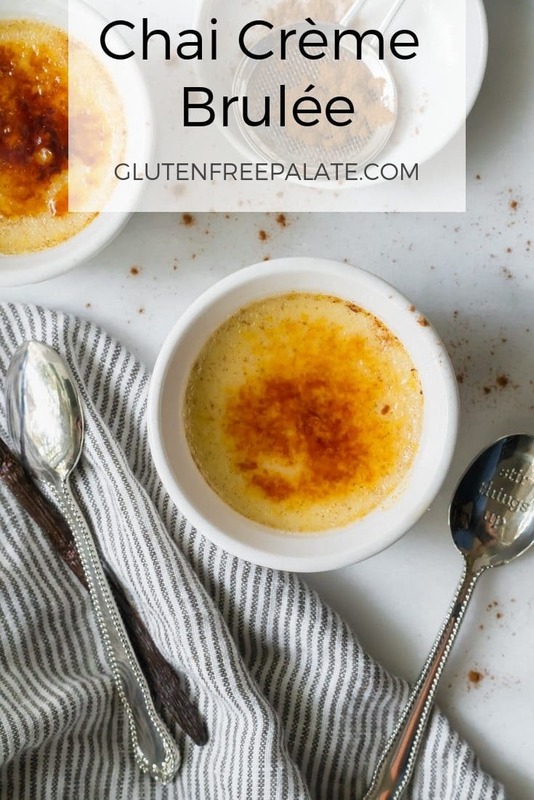 Can I make creme brulee dairy-free? Yes, you can make creme brulee dairy-free. The whipping cream in this recipe can easily be replaced with a high quality full fat coconut cream. I haven’t tried it with other dairy-free alternatives. If you substitute this recipe with anything else, you are doing so at your own experiment. 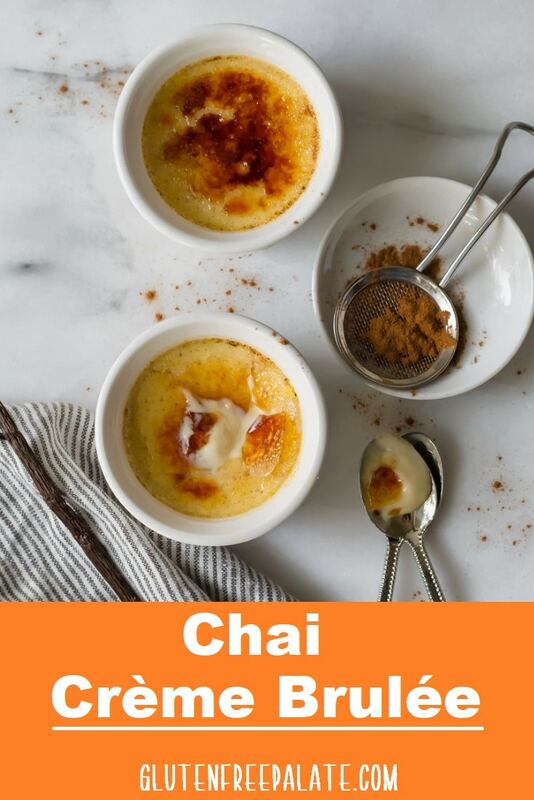 If you aren’t a fan of chai spices you can either leave out the spices all together and have a traditional creme brulee or you can use the cinnamon and vanilla to make a cinnamon creme brulee. This recipe take less then 10 minutes to prepare, and 35-40 minutes to bake. The recipe as listed delivers 6 servings. I have 5, 6, and 7 oz. ramekins. All three of these sizes work. I don’t know the diameter of each, but if you look on the bottom of your ramekins you should see the amounts they hold in ounces. The 6 oz. ramekins work best for this recipe. Why is my creme brulee chunky? If you heat your whipping cream up too much (to a rolling boil, and not a simmer as directed) and add it into the egg mixture right away then it will cook the eggs, creating lumps or chunks. Make sure your whipping cream is simmering before you remove it from the heat. It will cool slightly while you mix the remaining ingredients, before you add it in. Looking for more chai flavored desserts? You might like my gluten-free chai cupcakes, or my gluten-free chai coffee cake. If you make this chai creme brulee please come back and let me know what you thought. Also, if you have any questions please leave a comment and I will get back to you. Preheat oven to 325F. Boil 4-6 cups of water; set aside. Slowly bring whipping cream to a simmer in a saucepan over low heat, stirring frequently. Once the whipping cream is at a full simmer, remove it from the heat; set aside. In a medium mixing bowl combine the egg yolks, salt, 1/2 cup sugar, spices, and vanilla. Slowly poor the heated whipping cream into the egg mixture while whisking it together. Pour the mixture through a fine mess strainer into a medium bowl. This will remove any lumps. Place 6 (5 oz. to 7 oz.) ramekins into a large glass pan or roasting pan. Pour the cream mixture into the ramekins, distributing the mixture evenly among the ramekins. Place the pan in the oven then pour the boiling water into the pan until the water is half way up the ramekins. Bake for 35-40 minutes or until sides are set and the centers jiggle when shook. Remove from the oven and let cool for 15 minutes, then transfer the ramekins to a drying rack until they cool to room temperature. Cover the ramekins and refrigerate for 4 hours, or until fully set. They finish setting up in the refrigerator. When you are ready to serve your chai creme brulee remove the ramekins from the refrigerator and gently dab the tops of the creme brulee with a paper towel to remove any condensation. Spoon one teaspoon of sugar evenly over the tops of each creme brulee. Use a kitchen torch to crystallize the sugar on top. If you don't have a kitchen torch, you can place them under the broiler.